Why Choose an Energy Management System from Hocker North America? Höcker’s programmable control systems reduce the power consumption of pneumatic conveying systems and paint spray exhaust systems by up to 60%. Reducing the cost of producing is one of today’s most important challenges faced by companies. Innovative control systems with frequency inverters for electric motors can save money by reducing energy consumption. Reducing Energy Usage. Increasing Cost Savings. Production machines are not the main energy guzzlers in many production shops. The real energy guzzlers are HVAC systems and pneumatic conveying systems, in particular exhaust systems. Höcker’s control systems with frequency inverters can reduce the actual energy consumptions of exhaust fans by up to 60%. The frequency inverters were specifically developed for motors of air conveying fans. The drives match the actual volumes of conveyed air to the demanded volumes. This future-oriented technology is becoming standard in new pneumatic conveying systems. But it can also be an advantage to existing systems as control systems can be retro-fitted and then the exhaust systems become energy savers. These retro fits are not restricted to exhaust systems that were originally supplied by Höcker. When one of the production machines is taken off line, the speed of the air conveying fan is reduced to a level where the air flow rate matches the flow rate required for a reliable extraction of waste from the machines that remain online. A minimum fan speed is assigned to each machine, and a lower limit of the pneumatic conveying system is defined where trouble-free pneumatic conveying is still ensured. The programming of the control system is as easy as setting a microwave. Energy savings of approximately 10% are still achievable even when a pneumatic conveying system operates at full load; a frequency inverter will drive the fan at its optimum operating conditions. This way, an ordinary three-phase motor saves money with each rotation. An inverter will also ensure a quiet and soft start of a fan motor without any current peaks that could cause extra strain on the bearings. An inverter is easy on your wallet, on the motor bearings, and on the ears of your workforce. 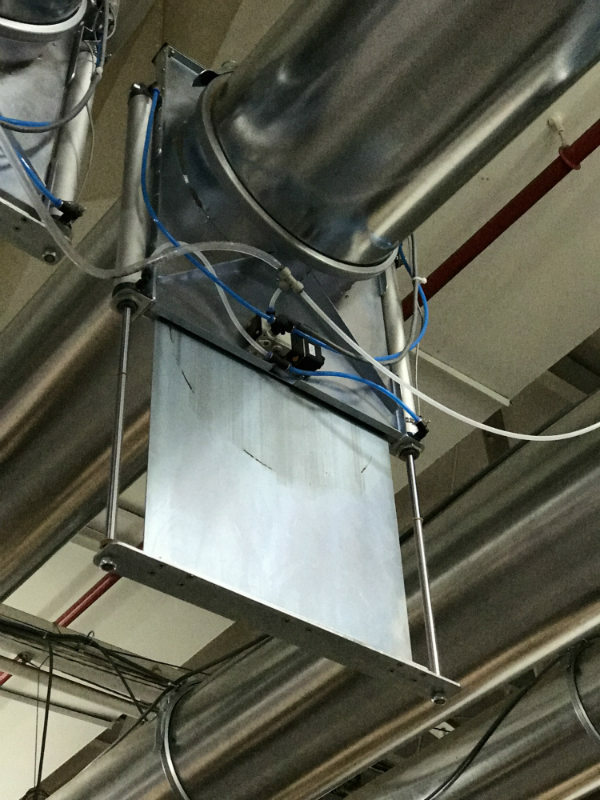 Our Hocker Service Team can use your data to prepare an energy saving model of your pneumatic conveying system; for large and complex installations a site survey might be necessary. The team will use this model to calculate the potential for energy savings, using software that was specifically developed for this purpose. Most importantly: updating a pneumatic conveying system is extremely cost effective. After a very short payback period, a Hocker control system saves money day after day. Automatic shut-off blast gates for suction pipes are prescribed legally for installation in new plants in many sectors, for reasons of work safety. Customary shut-off blast gates however, are quite bulky, they are difficult to install and are exposed to a high degree of wear and tear due to friction. Moreover, some of the products open very slowly or have drive-weak engines. But not so the ECO-P and ECO-MOT shut-off blast gates: a sealing developed exclusively for this purpose, made of heavy-duty, self-lubricating plastic ensures safe guidance and optimum sealing. ECO-P and ECO-MOT energy saving valves are available in the common diameters of 100mm to 250mm (without 220/225mm).